At Merrydale Manor, if we do not have any scheduled events then we are open for show-rounds both during the week and at weekends. We absolutely love and feel a sense of pride, to be showing couples and their families around our stunning Cheshire wedding venue. We often get asked many questions which we are more than happy to answer and we have put together our ‘Top five most asked questions’ for you to read in hope that this will give our couples a bit more of an insight to our venue prior to visiting. What does the price of the venue include? What does the accommodation pricing include? Is the venue exclusive to me even if I don’t take the accommodation? Do you accommodate for the elderly and disabled? We know that for couples searching for Cheshire Wedding Venues, pricing is a concern and we appreciate that all couples have a budget in mind, which is of course key when planning an event. At Merrydale Manor once you have booked our venue there are no hidden costs. The venue pricing includes everything from tables and chairs within the Merrydale Suite and not forgetting the luxurious seating within the bar area. The price also includes the use of the Makeup Room for the bride to use at her leisure with her bridesmaids. Merrydale Manor also provides air conditioning and LED lighting throughout the Merrydale Suite (choose your own colour lighting and change throughout day to evening) and the venue has a very high standard of interiors so that couples can spend more of their budget on the best in entertainment, flowers, and food rather than just dressing the venue. Merrydale Manor can sleep up to twenty-eight guests on site. This includes ten Courtyard Rooms and four rooms within the Manor House. All these rooms are doubles with an en suite and include mini toiletries as well as tea and coffee making facilities. Each Courtyard room includes air conditioning, a safe, an iron and hairdryer plus one of our Courtyard rooms is an interconnecting room. The accommodation rate will also include a full English and Continental Breakfast for your guests the morning after your overnight stay. Yes! Merrydale Manor is an exclusive Cheshire Venue and will be hired privately for you on the day of your event – from the moment your guests arrive right up until when everybody has left. Even if you do not choose to take the accommodation at Merrydale Manor then the rooms will simply just not be used. 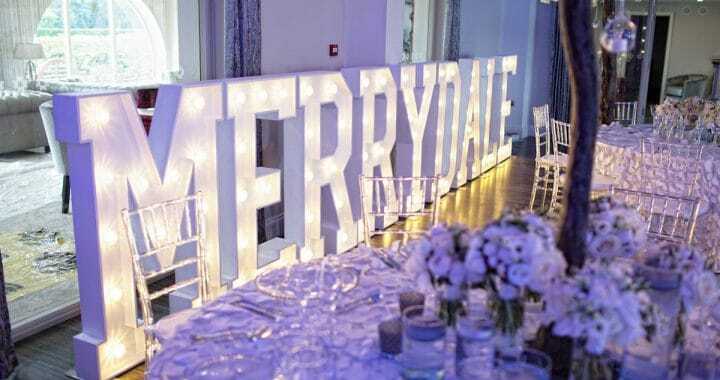 At Merrydale Manor, we want your day to be special and individual whether it is a wedding, a christening or a corporate event – the venue is yours entirely. Here at Merrydale Manor, we believe it is particularly important to us that we can accommodate for all guests including the elderly and disabled. We have a disabled toilet which is located nearby to the Merrydale Suite and we have recently installed a lift leading up to our Courtyard rooms and Bridal Suite. One of our courtyard rooms also includes a disabled toilet. Merrydale Manor is intended to be enjoyed by all! If you have any more questions about Merrydale Manor then please give us a call or drop us an email at any time.